Coda's formula language has a lot to offer, and hundreds of inputs you can use as you build your doc. But, as you're getting started, or going about your daily tasks, you won't need the whole suite. If you master these top inputs, you'll be able to accomplish most daily tasks. Before we get into the most commonly used formula inputs, there are a few important things to know about how to write formulas in Coda. All of these ingredients are essentially lists of information. More on this later in the article! With complex formulas in Excel, you’re required to wrap methods around “inner formulas” ー leaving you with this long block of )))))’s at the end of your formulas which can be really hard to understand. If you like that approach, Coda will support you, but you can also use chaining to help with readability. Count will be your go-to formula to understand your progress on tasks, RSVPs for events, and more. You can use Sum() in a formula just like Count. To help you out, you can scroll to the bottom of any table and select n from the summarize menu. 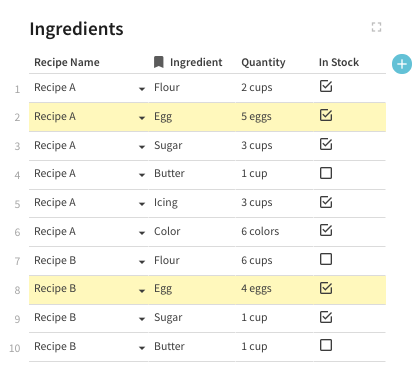 CountUnique helps you count the number of non-duplicative items in your table. In Excel, the smallest unit is a cell. Since Coda is a database at heart, the smallest unit is a row. What this buys you is the ability to take all of the contextual details of an item with you, and you can drag and drop rows and columns around as you see fit. For example, dragging and dropping tasks as their status changes. Boolean Logic is a fancy term for determining whether or not the answer to your question is true or false. Your question can be simple like "is the status of this task equal to "Done?" (true), or more complex "is the status of my task equal to "Done" and assigned to me or my colleague? (false). You'll normally use AND or OR logic when filtering a table/view or when using the FILTER() formula. This function allows you to see the results for items that meet multiple requirements. For example, I might want to know any task that is Not Started AND assigned to me so I know what I need to focus on. This function lets you decide to cast a wider net if you're interested in seeing the results of a few different queries. 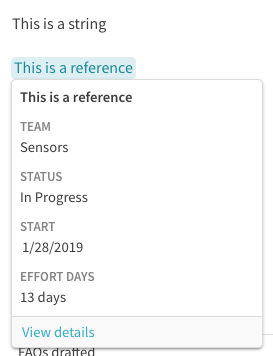 For example, as a project manager, I want to know tasks assigned to me OR tasks that aren't started yet so I can manage the team. Just like in math problems, you'll use parentheses to separate multiple AND and OR functions so that all of your calculations happen in the right order. Coda will calculate anything inside of a parentheses first. In the example above, we will multiply 2 times 2 and 4 plus 4 before doing the division. In the same way, use parentheses to specify how multiple AND or OR functions should be grouped. By default, the formula applies the logic from left to right in the order that it appears. If you want to specify a specific order, just use parentheses. Did you follow that? It's a subtle change, but can make a big change in your filter. If you have questions, feel free to reach out to us - we're happy to help 😄 . When you're working with a set of data, many times you're looking to pull out a specific subset of it - like the first item of a list, or the first task assigned to myself. 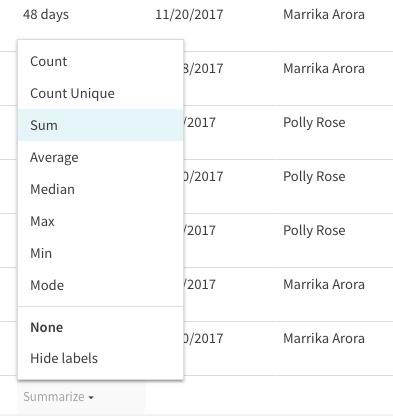 When you're dealing with data a list doesn't necessarily need to be a literal list of text, it could be in a table, or even the details of a row. Strings are a set of characters, like the status of a task, or the cost of an item on your grocery list. It's a fancy word for plain text. If your formula ever gives you an unexpected result or error, there are a few best practices for troubleshooting. Each input will also have an icon letting you know what type of item you're working with. Make sure that you're pulling the right element (e.g. column, table, row, etc.). Notice in the table below that if there's only one of those objects, the icon will look different than if there are multiples of that item. When all else fails, start creating your formula piece by piece. You'll then be able to ensure that each step is function as expected.